We currently have several positions that are seeking candidates to do just that. Our Service Coordinators are our “boots on the ground” when it comes to resident services. Their main job function is to make sure our apartment residents are informed and connected to available community resources. Service Coordinators are resources themselves, often serving as advocates, pathfinders, and cheerleaders for residents who may need an experienced navigator for community and neighborhood services. Several locations are available. Our Maintenance Technicians are well-versed in everything it takes to keep an apartment community running smoothly. They are customer-service oriented and well-equipped in general contracting experience and power tools. Handling both simple and complex engineering tasks, our maintenance teams handle everything from changing light bulbs to air conditioning repairs to general carpentry and groundskeeping. Several locations are available. We currently have a Building Host position at our Lakeland Park Apartments in Clear Lake, Iowa. Building Hosts assist the Community Manager with helping maintain the building premises and provide positive, professional interaction with fellow residents. To qualify for this position, applicants must be eligible to live on-site (62 years of age or older or have a disability). Previous residential or customer service experience is preferred. We currently have a Building Host position at our Shire Apartments in Sioux City, Iowa. Building Hosts assist the Community Manager with helping maintain the building premises and provide positive, professional interaction with fellow residents. To qualify for this position, applicants must be eligible to live on-site (62 years of age or older or have a disability). Previous residential or customer service experience is preferred. We’re currently seeking a friendly multi-tasker to handle our front of office tasks. These include answering phones, greeting customers and contractors, making appointments, and helping the Leasing Department with applicant paperwork. A positive attitude is just as important as a high proficiency in Microsoft Office and solid communication skills. Sound like you? Learn more and apply. We provide excellent benefits beyond the satisfaction of knowing you are serving people who need great housing and quality service the most. We also provide training, paid holidays, and a team-based, collaborative environment that welcomes good ideas and positive attitudes. Are you ready to join us? 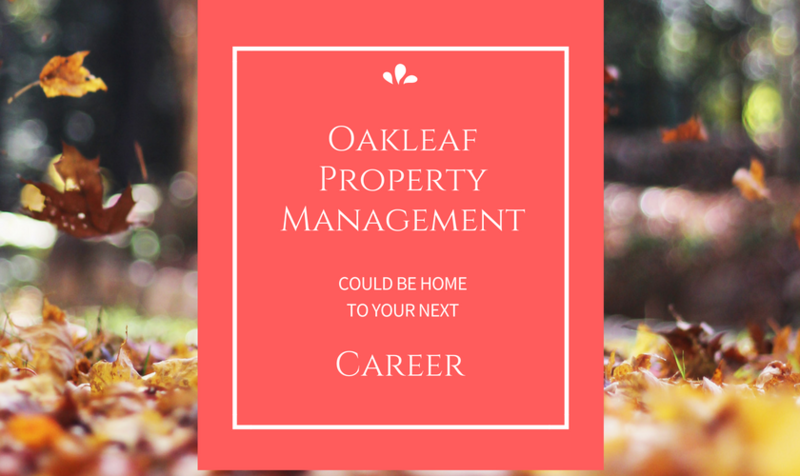 Also if you would like to become part of the Oakleaf PM community, click the button below to submit your application.